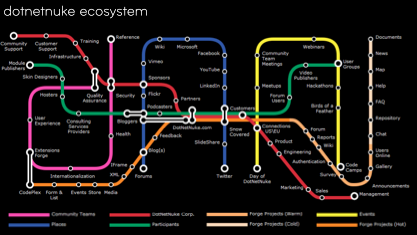 More examples on this blog: Ten Examples of the Subway Map Metaphor. 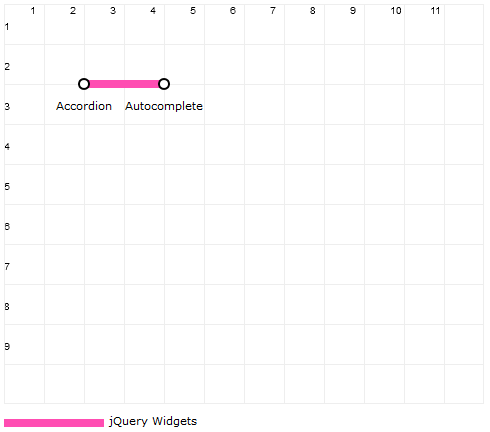 With these goals in mind, I started creating my jQuery plugin. A few days of concentrated effort later, I had a working subwayMap plugin and am quite pleased with the result. You can download the plugin below and documentation follows in this post. I hope you will give the plugin a try and find it useful. 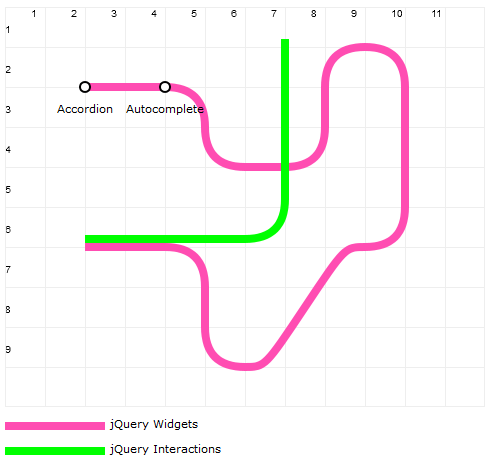 Here is a guide to using the Subway Map Visualization jQuery Plugin. Before you get started, there’s one thing you’ll want to keep in mind — beautiful subway maps are never automatic; they are almost always the result of care in design and placement to ensure that the resulting map is functional, legible and beautiful. This plugin is just a tool…you will still need to plan and design your map in order to produce a good result. Demo: Here’s a demo of the finished map described in this guide. 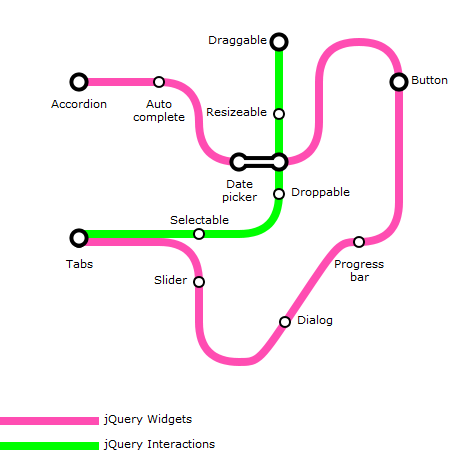 The subwayMap plugin is referenced similar to other jQuery plugins by adding a script element to the HTML markup. The only supported option (at present) is “debug” which has a default value of “false”. Setting it to true will display some debug statements in the JS console. An outer DIV element to control general placement, background etc. One UL element for each “line” desired in the map. For each UL element, one or more LI elements with either plain text or an A element with plain text. An LI element provides coordinates for drawing lines and/or markers on the map. Each of the DIV, UL and LI elements make use of custom attributes to convey how the map should be rendered. These are explained in the Step-by-Step section below. 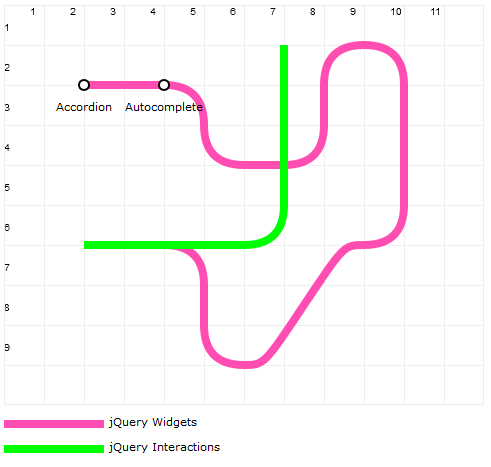 The subwayMap plugin renders the map on a grid with the origin at top left (i.e. X coordinates extend from left to right and Y coordinates extend from top to bottom). The size of this grid depends on a value you define called “cellSize.” For example, if you define a cellSize of 50 and specify a grid of 20 columns by 10 rows, then you will have a map that is 1000 pixels wide and 500 pixels high. For each UL element, a <canvas> element that is the size of the grid is created and positioned at (0,0). Subsequent <canvas> elements are stacked on top of the prior <canvas> elements. Station and interchange markers for each line are also created in separate, stacked <canvas> elements, however their z-Index is always higher than that of the <canvas> elements containing the lines. Finally, all labels are added as elements with the highest z-Index of all the elements in the map. As you can see from the illustration, the result of the sample markup was a grid with numbers, a line drawn from (2,2) to (4,2) and finally markers at both coordinate locations. The markers are automatically added whenever you have any content in your LI element and later, we’ll see how you can override the marker type. To get the curves, some of the coordinates had to be changed in order to achieve the X and Y coordinate difference of exactly “1”. 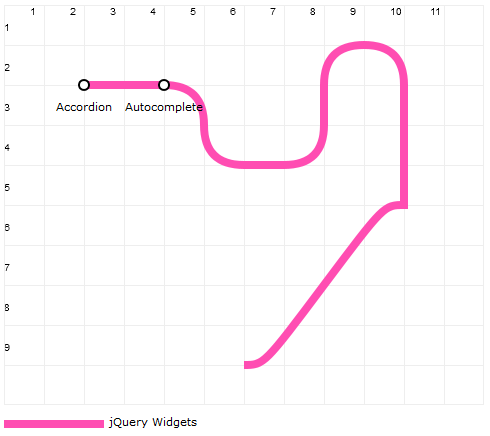 Note the additional “data-dir” attribute that determines the direction of the curve. The final result is a line that is similar, but not the same as the original and definitely more pleasing to the eye. Let’s make the line loop around a bit and then go south on a diagonal run. In this map, there is a portion where both lines overlap. This is a fairly common situation and if you do nothing, the line that is drawn last will be at the top. This is less than ideal for communicating information, let alone train routes. To solve this problem, the plugin allows you to “shift” a line in X and/or Y directions by a multiple of the chosen line thickness. (UL) data-reverseMarkers: If the markers should be rendered white on black instead of the default, black on white. The default is “false”. IMPORTANT: Markers are displayed only if the LI element contains content. Interchange markers ignore any coordinate shift values specified for the line. 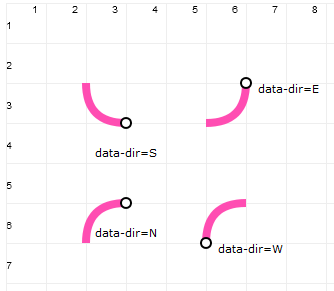 (LI) data-markerInfo: For “interchange” or “@interchange” markers, this attribute is used to define scenarios in which the interchange marker has to “stretch” across multiple lines or connect lines that are not next to each other. The attribute value consists of a letter “v” for vertical or “h” for horizontal, followed by a number representing the number of line widths to stretch (example: v3 or h4). The marker is rendered at the coordinate position specified and extends either vertically upwards or horizontally to the right. While it is easy and convenient to use the LI elements that define line coordinates to also define markers, sometimes this does not yield the best result. The marker may appear off by a few pixels. In these cases, it is best to add an LI element for the marker, use the “@” prefix and provide precise coordinates with decimal places (Example: 1.5,2.25). Here is the markup and map again, updated with station and interchange markers. (LI) data-labelPos: Specifies where the label should be displayed using a directional abbreviation. Supported values are N, E, S, W, NE, NW, SE, SW. (Default is “S”). Sometimes your label may be too long and text-wrap may be needed. To do this, you can use “\n” within the text of the label (<br />will not work since the only markup supported for a label is the <a> element). Labels are added as absolutely positioned <span> elements and when the map is added inside a DOM element with a complex, CSS layout, they may not always appear in the right place. Let’s set the label text and position, turn off the grid and look at the final markup and rendered map. There you have it…a map that faithfully reproduces the style of the London Underground map, but hopefully, is not too difficult for you to create once you get familiar with the custom attributes required in the HTML markup to render the map. Enjoy! , so I added an id property to the . After the map was generated, the id propertied had been removed. Do you have a workaround on this? 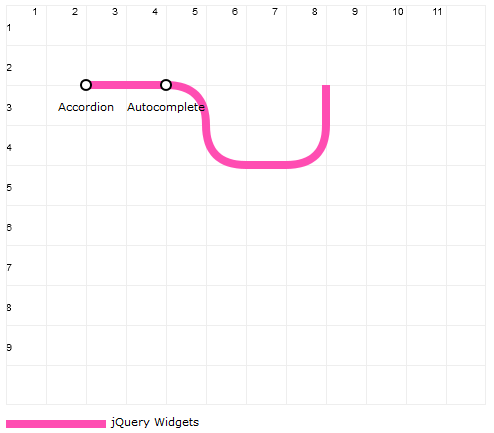 @wonderman The plugin swaps out the unordered list and replaces it with a canvas element, so there is no way to refer to any of the original elements once the script has created the subway map. If you need to do something with the <li> elements, I suggest you do it before the plugin renders as the DOM is irreversibly changed once the rendering is done. Hi, It's a super cool library. By the way we are using it on http://www.metro.smartdsign.net/ with a route trace (minimal distance between stations), Hope you like it! @Simon: I did a lot of research and was careful to ensure that the HTML markup was valid. 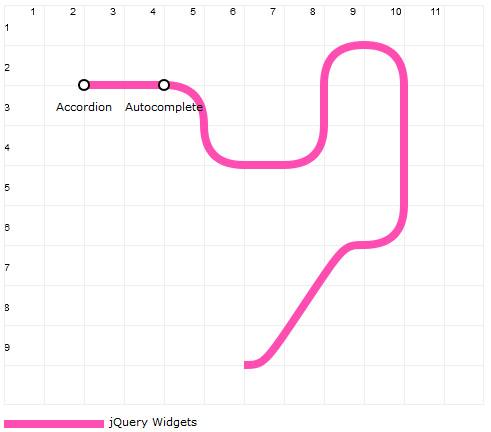 This is why I chose the data-* approach, which is the recommended way to add custom attributes per the (evolving) HTML 5 spec. Even jQuery supports these attributes natively. http://www.google.com/search?aq=f&sourceid=chrome&ie=UTF-8&q=html5+data-* As far as moving it to a separate file, while it would work in many situations where you have unfettered access to the server to create files, it would not work in scenarios where you just want to embed some HTML on a page and be done. I think the XML approach could be in addition to the attribute approach, instead of replacing it. I will include it in the next (overdue) release. Thanks for the feedback and tip. My 2012 web design and marketing round-up of all things awesome. fix for IE is changing line 118 from self=this; to var self=this; see IE on inner / outer window and self issues / global variable scope. This is awesome! Is there a way to split or fork a line? Say, I have one station that leads to two different stations that are not linear, they are rather parallel one another, but belong to the same line… Nested UL's perhaps? Very helpful library thanks. 1- I would like to display a popup message when a user click on station, could you help me how ? 2- Is there zooming possibility ? I would like to scale the metro map to mobile phone screen and I am looking for a zoom feature. Is it possible to convert this to render an SVG? - this would then make the individual stations interactive. We could then listen for events on each station. Awesome plug-in. Once you get the hang of it, it becomes very easy to customize. Many, many thanks! Very cool! Great work. Fun to play with. Thanks for sharing. While playing around with the plug-in, and following the step-by-step implementation tutorial, I found an issue with label positioning. The label's positions are calculated in dependency to the position of the $("sampleselector") relative to the webpage's origin. To fix that, you have to use plain positions in the label markup code in line 405: var style = (textClass != "" ? "class='" + textClass + "' " : "") + "style='" + (textClass == "" ? "font-size:8pt;font-family:Verdana,Arial,Helvetica,Sans Serif;text-decoration:none;" : "") + "width:100px;" + (pos != "" ? pos : "") + ";position:absolute;top:" + (y) + "px;left:" + (x) + "px;z-index:3000;'"; Then add the following line before "self = this;" in line 123. el.css("position", "relative"); This way the labels are positioned relatively to the parent div. Also, I think it's handy to remove the comment slashes in lines 121 and 122, so the element will have the size of the map's canvas and following page content won't be rendered below the map. 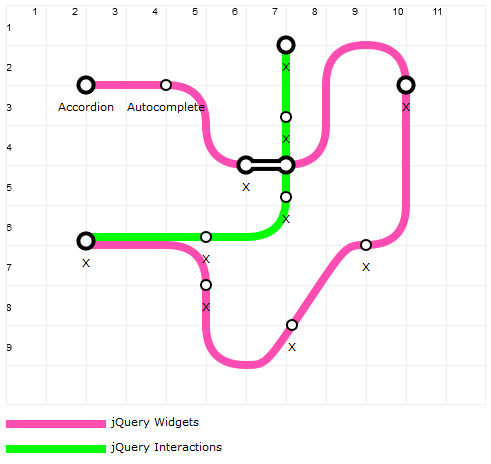 Hello Nik, congratulations for the amazing plugin subwayMap! A resource commendable! I would like to implement the plugin in my website www.giovanniscafaro.it but do not know how to install it. I know the basics of HTML and CSS, but I do not know what should I do to install this wonderful plugin in my wordpress. It would be nice if you would do for us newbies a step by step guide so that we can install subwayMap wordpress sites, so that we can access this wonderful resource and run it in the site? Then with a little practice we will definitely work. Thank you again. John, Naples, Italy. Page unresponsive error occurred when continuously access the page if data is more than 100 parallel lines. its also too slow if there is more data available. I really loved this tutorial. I was able to create the railroad map I wanted with relative ease however I am now trying to add it into a rail/angular application and I'm having a hard time. Is there a best way to get this to work with rails? very very very very very great . think you. that i use her to show pipeline. Incredible plugin! Thank you so much! I used it to help one of our customer visualise their customer journey and interactions with different staff and departments and it really helped us figure out where the processes could be improved upon! Wonderful stuff! Hi great work man. i need some click event in this map. can you possible to uploaded click event code ? We need to add a click event inside the map. Is it possible ? Any issues with device compatibility? ...with responsive design? Great work, does the job brlliantly. Just one question, I am using it as a Navigation tool. Is there a way in which I can have a dot in the middle of circle to indicate what "station/page" I am on? What a nice plugIn... I tested in a very simple demo and it works as easy as is. But now I have a doubt'bout how to fill with diferent colors the nodes marked as points. Do you have an example of how to do this? Best regards. 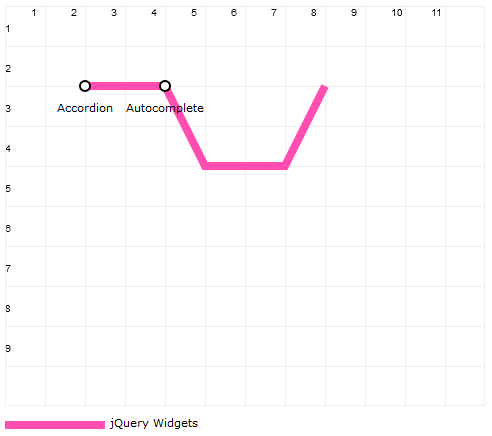 35+ Useful jQuery Menu Plugins – Help Users Navigate Better! How can I add custom shapes (Point, Polygon. etc) on different places of this map? I am trying to use this jquery with Spring MVC, i am not able to render the connection lines, can some one help me out.